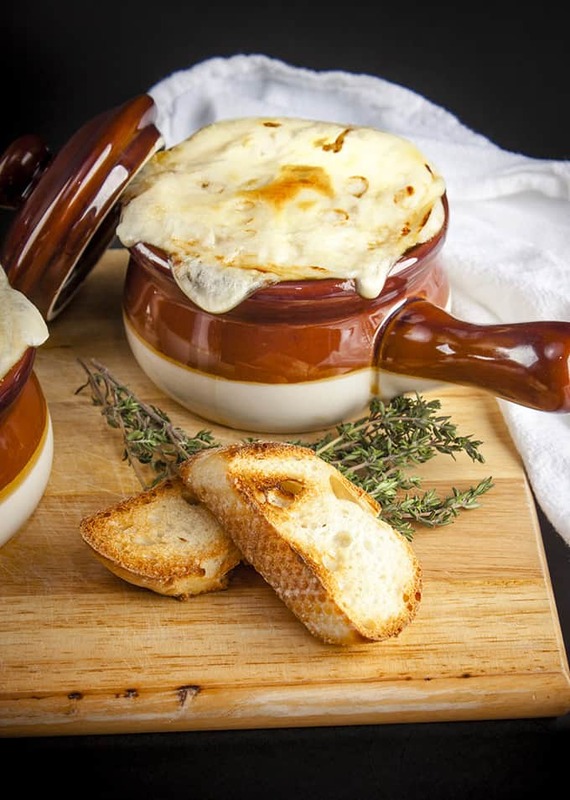 French Onion Soup is traditionally made with beef broth – a fact that drove me crazy while growing up vegetarian. This recipe captures all the intense flavor of the original using vegetable broth. The technique is taken from Cook’s Illustrated and is absolutely perfect. While it still takes several hours to perfectly caramelize the onions, beginning in the oven reduces the number of deglazing cycles and active time. The extra time is utterly worth it. The final result is a rich, sweet, and intensely flavorful broth. Like, crazy flavorful. Like, as much as you might want to, you won’t be able to eat more than a bowl in a sitting or your tastebuds will explode. After much research, I bought these adorable onion soup crocks on Amazon and couldn’t be happier. They’re the perfect size to hold an entree serving of soup, stand up to the broiler, and are dishwasher safe. You’ll start with a pot filled to the brim with raw onions but they’ll reduce significantly as they caramelize. Be sure to use yellow onions – white or sweet onions would make the already sweet soup cloying. I replaced the Emmental with a low fat Swiss to cut back on the calories but this soup is so rich and savory on it’s own that it really doesn’t need the cheese or crouton. Leave off the cheese and swap out olive oil for the butter to make this vegan. Or skip the crouton for a hearty gluten-free, paleo-friendly meal. This soup tastes even better a day or two after cooking making it an ideal make-ahead dish. Coat the inside of a large Dutch oven or heavy bottomed pot with non-stick spray. Add butter, onions, and 1 tsp salt and cook, covered, for 1 hour. Meanwhile, toast the baguette slices in a toaster oven or 400 degree oven. When ready to serve, top a bowl of soup with two croutons, sprinkle with an ounce of cheese, and place under the broiler until the cheese is melted and beginning to brown, about 5 minutes. This looks TO DIE FOR! This is one of my boyfriend’s favorite dishes, so I can’t wait to make it for him! I know it’s typically made with beef stock so I can’t wait to try this! Beautiful pictures. I am a lover of French Onion and usually feel that you have to have the beef stock to make it taste right. But, this soup is so good I don’t think most people would even know it’s vegetarian. I kept hounding Maggie for more of the broth as it was awesome and our house smelled great all weekend! 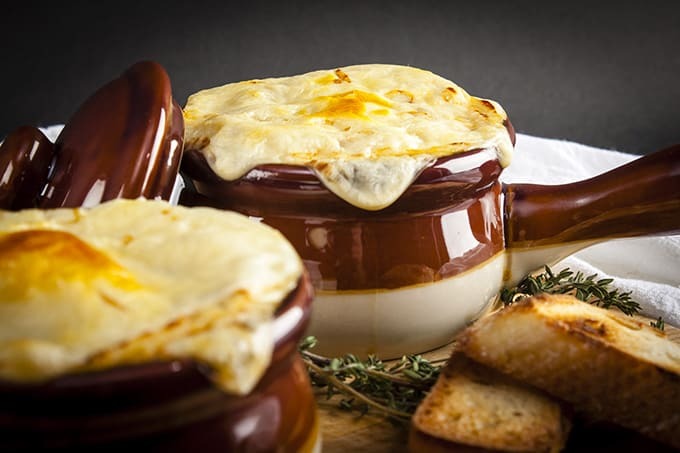 Seeing his onion soup recipes I have found it fantastic, I am going to recommend, with its translation into Spanish and put the credits of both the recipe and the picture. Please feel free to share with your readers! Thanks! I just spent the afternoon making this and it was well worth the time it took to cook the onions. What a difference in flavor by cooking them in the oven!! 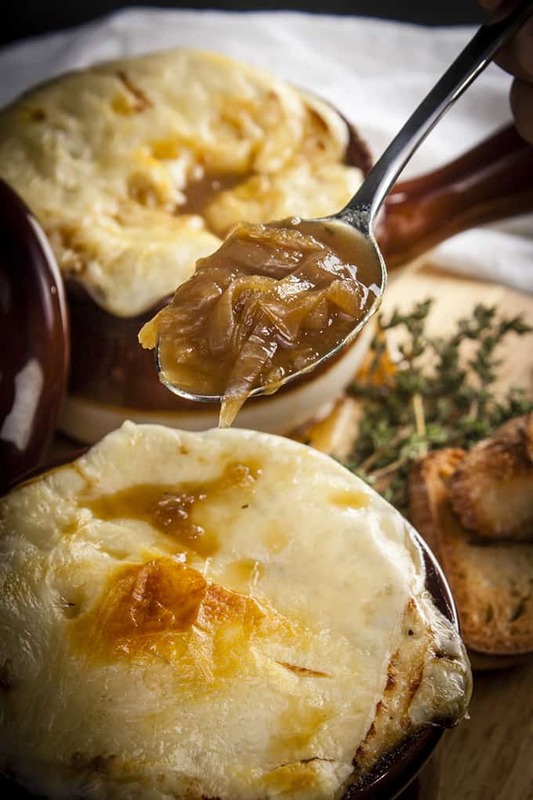 This is the best vegetarian French onion soup recipe is have tried! Thanks so much for the reply! I’m thrilled you love this as much as we do. It’s so hard to find really flavorful French onion soup that doesn’t use beef broth but the oven method is magic. Very tasty. I would make this again. I want to make this soup for Christmas. Is it ok to make ahead, prior to croutons? Thanks!! Oh – I saw your recommendation to make it ahead! Can’t wait to get started! THANK YOU! Yes! We’re visiting Brad’s parents for Christmas and I made this for dinner last night. It was a hit! I know your family will love it, too! Absolutely amazing. I’ve added crimini mushrooms at the step when it moved to the stovetop. Melts in your mouth. One comment: You specify what to do with the lid in the first two cooking steps, then stop mentioning it. The difference between cooking off moisture and trapping it can be significant. What do you do with the lid through the stovetop deglazing phase? Thanks so much, Barb! I have to try it with the mushrooms. Yum! You definitely want the lid off during the stovetop phase to evaporate the liquid and form a nice, dark fond between deglazing cycles. I’ll update to reduce any confusion. Hello! How many mushrooms did you add? Will this soup be just as wonderful for my vegan gluten free friends if I eliminate the bread and cheese? Well, I think everything in the world is made better with bread and cheese but this soup will still be wonderful without. We usually omit it ourselves just because it’s so rich for everyday eating. I think your friends will love it! i cannot use anything containing alcohol. What can I use for deglazing in place of sherry? You should be able to find cooking wine or cooking sherry without alcohol but, if not, just deglaze with broth or water. It won’t hurt the taste too much – just detract a touch from the complexity. Enjoy!! 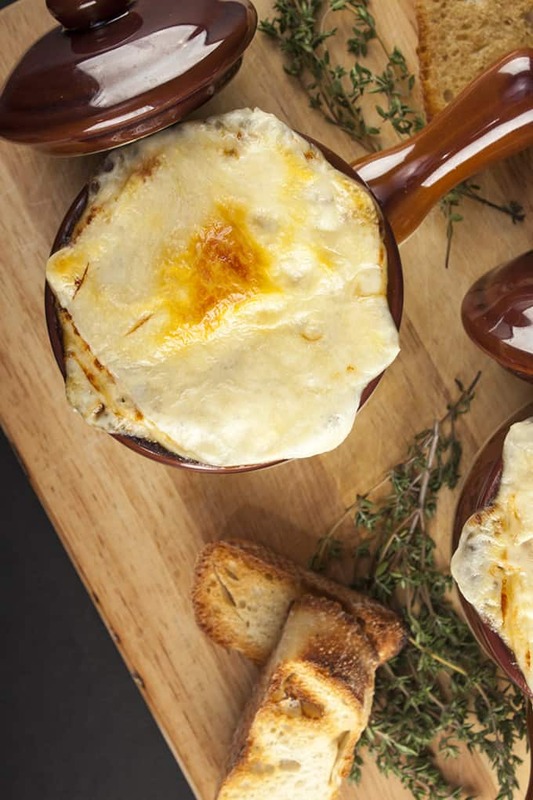 I’ve been searching for a vegetarian French onion soup and this sounds amazing ! I have a quick question- my oven isn’t quite big enough to fit my Dutch oven. Would it be okay to roast the onions in a baking dish for the oven portion of the cooking process and transfer to the Dutch oven for the stovetop portion? I’m worried I won’t be able to transfer all the browned bits of flavor- what do you think? Thank you! Hi Chelsea! You should be just fine transferring from your baking dish to the dutch oven after the oven portion. Most of the fond is created during the stovetop portion so you shouldn’t miss much. If you’re worried, you can do an extra deglazing cycle on the stovetop but I think you’ll be just fine. The ingredients call for vegetarian broth, but the instructions say to keep adding water. I think something is amiss? Or am I misunderstanding? Thanks! Whoops! I found it! Sorry! This site did not allow me to delete my previous question! Haha! No worries – probably helpful for other folks 🙂 I hope you love the soup! Hi — what size (capacity in liters) dutch oven do you use? I have made this before (it is wonderful soup, by the way) using two smaller ones to hold all of the onions but I don’t think they will fit together in the oven we have in our new flat so was considering buying one larger one but want to make sure I get the right capacity. Hi Mary! I have a 6.75 qt Le Creuset Dutch Oven. It looks like that’s about 6.4 liters. I hope that helps! It’s a common and really aggravating misconception that French onion soup HAS to have beef broth. This originated as a really simple peasant dish and didn’t include any stock at all—just the onions, water, splash of sherry, maybe some herbs if you had them, and a chunk of old bread. Thanks for spreading the word and taking back this recipe for non-meat eaters and gourmands alike! At the end of the 2nd hour it was completely burnt. What a waste. Really disappointed. I’m so sorry to hear, Mat! Did you have it covered? The goal is to caramelize the onions so they should be dark brown. However, if they were black and crispy something definitely went wrong. You’re 100% right. Heat it on the stove top after you take it out of the fridge. Check the seasoning once it’s hot and add more salt and pepper if needed. It can simmer for awhile before you put it in the bowls, top with bread and cheese and broil. I’m so jealous of your guests. This is going to be a hit! Truly delicious and well worth the effort. I was amazed that the onions didn’t brown after the first hour, but took nearly three hours to turn golden. The fond is key: I was afraid the dark bits would turn the soup bitter, but next time, I’ll try to produce even more. Delicious! Building up the fond like that made the flavors nice and complex. I found it didn’t need that much broth. Thanks for the recipe! Yo Maggie, when do you add the pepper? Heya! At the end when you adjust seasonings, add salt and pepper to taste. Could I make this in a crock pot? Thank you! I’m in the process of making this now. Hour 2! I don’t have dry sherry. I have dry vermouth, red or white wine. What would be the best to replace the sherry with? Personally, I’d use a splash of the white wine but I don’t think you’ll go wrong with any of those! Thank you! I’ll use same amount as sherry. BTW it smells so good already! Can’t wait to eat it. This was wonderful! I’ve been a vegetarian for 47 of my 59 years of life and have always wanted a veggie french onion soup and there yours was! It was the cooking of the onions for hours, first in the oven then on top of stove that made this so flavorful and thanks for that tip. I was a little worried the deglazing would make it bitter but noooo, amazing! Of course i changed some things, i simply cant help myself from thinking “what if…” but the cooking of the onions is the key I never would have unlocked. Thanks and of course my house smells amazing too!!! The first time I made this the soup came out INCREDIBLE. Now I am afraid it was just beginners luck! I don’t know what I am doing wrong. I have made it three times since, and each time the soup has been bitter. Obviously it means the onions are burning. Any ideas how I can prevent this? My first idea: are you keeping the pot covered in the oven? There shouldn’t be any browning during the first oven pass since the lid will keep in the steam. Maybe check to make sure the lid is well-fitting and leave it on for the second pass as well. Let me know. We need to solve this. I can’t imagine the heartbreak of having this soup once and not being able to recreate it! Please do let me know. When you take it out of the oven after the final round the onions should still have a lot of moisture. If they’re dry, brown and sticking to the sides we’ll know something went wrong during the oven portion. If they’re still moist and just golden on removal, we’ll know the issue is with the stovetop deglazing. Either way we’ll get it fixed! !